Evidently, Mother Nature didn't get the memo about it being the end of April, cause it's been rather chilly here in Nebraska. And with a steady drizzle reinforcing the chill, I thought soup would be a great way to help keep us warm. Plus, I've got a big ol' ham from Easter to use up. Don't have any ham on hand? No problem. Skip the ham and make a vegetarian version. Or another good option would be to fry up some bacon and sprinkle it on top of each serving. 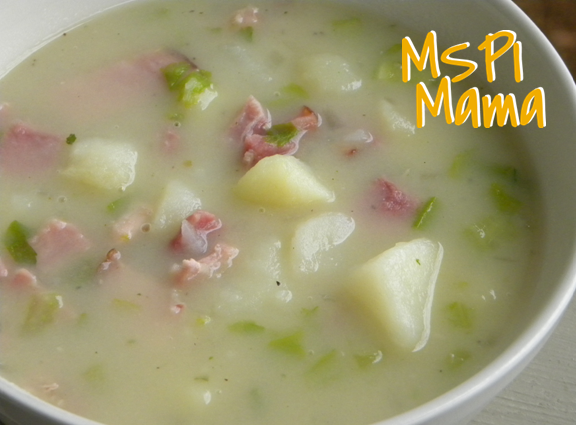 Combine the potatoes, celery, onion and broth in a stockpot. Bring to a boil, then cook over medium heat until potatoes are tender, about 10 to 15 minutes. In a separate saucepan, heat oil over medium-low heat. Whisk in the flour and cook, stirring the roux constantly until thick and smooth, about 1-2 minutes. Slowly stir in the rice milk, whisking constantly to keep lumps from forming. Continue stirring over medium-low heat until thick, 4 to 5 minutes. Add salt and pepper, to taste. Add ham to the stockpot. Stir the rice milk mixture into the stockpot, and cook soup until heated through. Adjust seasoning with salt and pepper. Tip: Like a thicker soup? Mash some of the potatoes in the soup. I love this recipe. I've made it twice already. I chose to do 1.5 cups of diced baby carrots instead of the celery/onion, per my family's taste buds. Very creamy! Thank you. There's probably 8-10 cups of soup by the time you're finished making it, Amanda. Thank you! I think we'll have this for Christmas!